Big and bad. 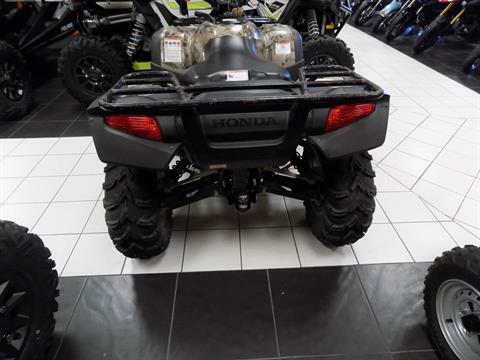 No two words better sum up the FourTrax Rincon, the flagship of Honda's powerful and capable utility ATV line-up. 700-class powerplant. Electronic fuel injection. Fully independent rear suspension. TraxLok™ push-button, on-demand 2WD/4WD. 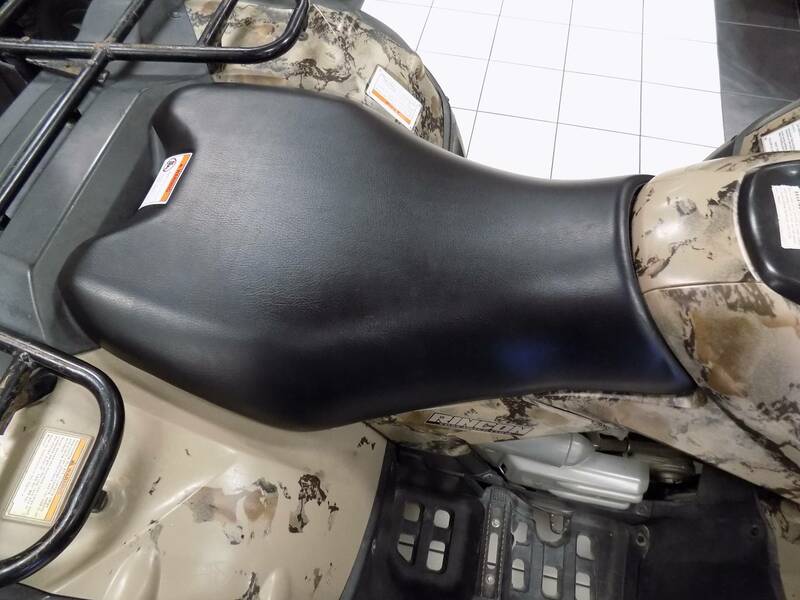 Natural Gear™ Camo bodywork. Come to think of it, just what does this industry-leading machine not have? 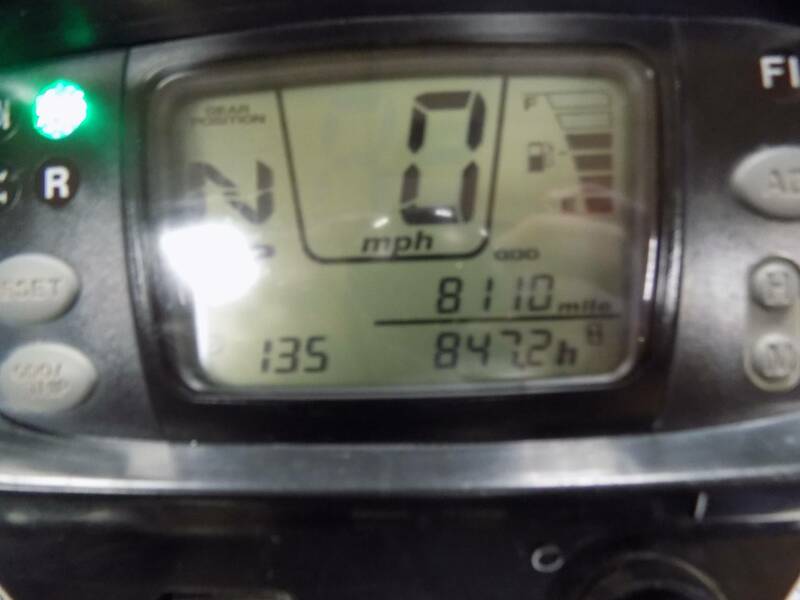 Multi-function LCD digital instrumentation is compact, tough and waterproof, featuring large readouts for gear-selector position, speedometer, odometer, resettable tripmeter and hourmeter/clock. 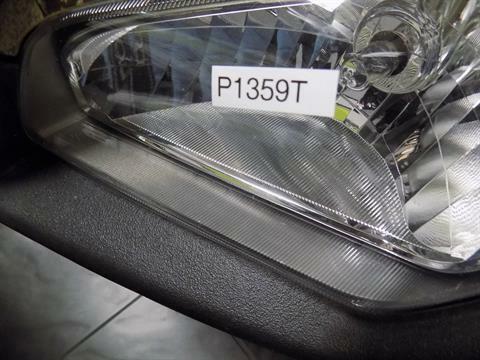 Instrument housing includes LEDs for drive, neutral, reverse, temperature warning and FI warning indicator. A fuel gauge located within the instrument housing comes as standard equipment. 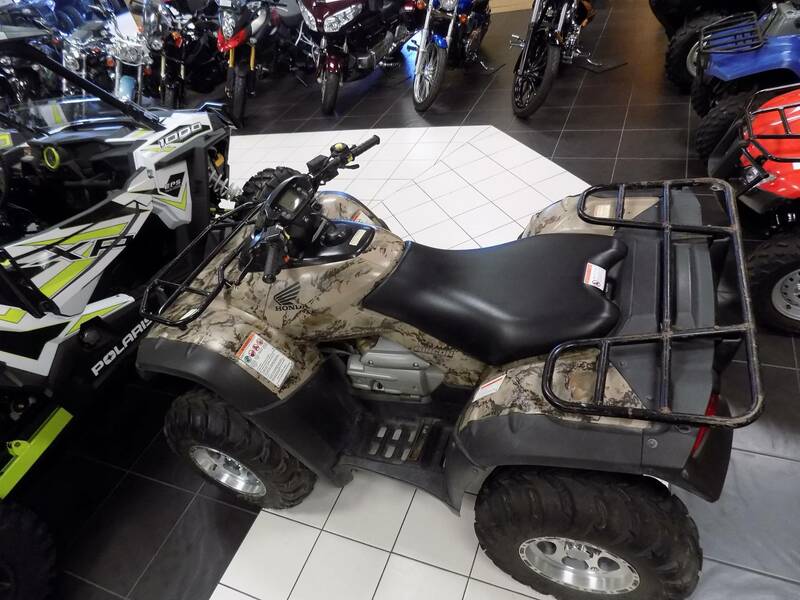 Durable, comfortable, easy-to-use controls include a keyed ignition switch for added security, parking brake and a handlebar-mounted choke lever. 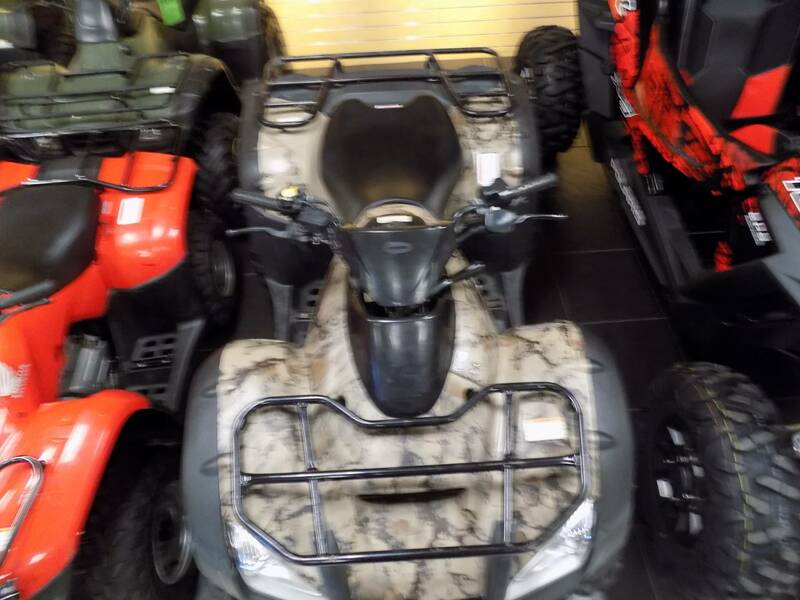 Convenient electric starter with a lightweight auxiliary recoil starter and an automatic internal decompression system. A tough rubber cover protects the gear-shift button from dirt, water and mud. Handlebar switches, controls, indicator lights and warning labels use internationally approved ISO graphics symbols. 18-amp battery for increased performance. Thickly padded seat uses dual-density foam to provide all-day riding comfort. Large, lightweight plastic fuel tank with 4.5-gallon capacity, including 1.08-gallon reserve. Washable air filter for easy maintenance and consistent performance. Side-opening compartment has 4 liters of storage capacity and can be opened when the rider is seated. 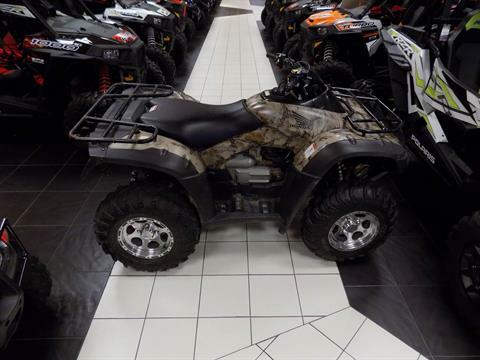 A rugged steel perimeter frame and four-wheel independent suspension provide an exceptional 10.0 inches of ground clearance. 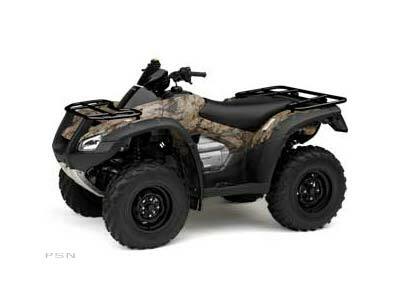 The Rincon's steering mechanism design allows light steering effort and a tight turning radius of 10.8 feet. Independent double-wishbone front suspension uses premium shock absorbers to provide 6.9 inches of suspension travel for a plush, comfortable ride. Honda's independent rear suspension uses a double-wishbone design and features forged-aluminum knuckles and upper/lower A-arms to substantially reduce unsprung weight. 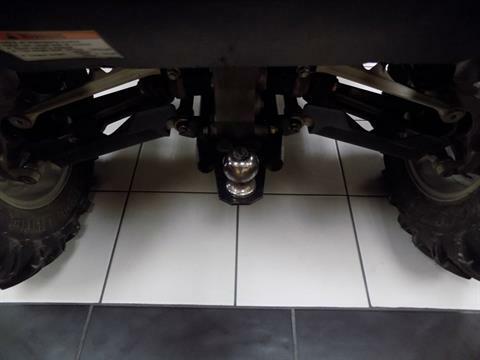 The rear knuckle pivots use lightweight metal bushings in place of conventional ball joints and radius arms, eliminating toe-in as the rear suspension travels through its stroke. This simple design maintains rear wheel alignment and further reduces unsprung weight, contributing to responsive overall handling. Lightweight single-tube gas-charged rear shocks and an anti-sway bar provide plush, well-controlled damping throughout the Rincon's exceptional 8.0 inches of wheel travel. Dual front disc brake calipers feature a patented built-in scraper system to remove mud and snow from inside the front wheel to help prevent buildup of debris between caliper and rim to ensure consistent braking performance. Brake pads feature thick, long-wear material with improved mud durability, feel and control. Scraper gives audible warning when pad life is low. 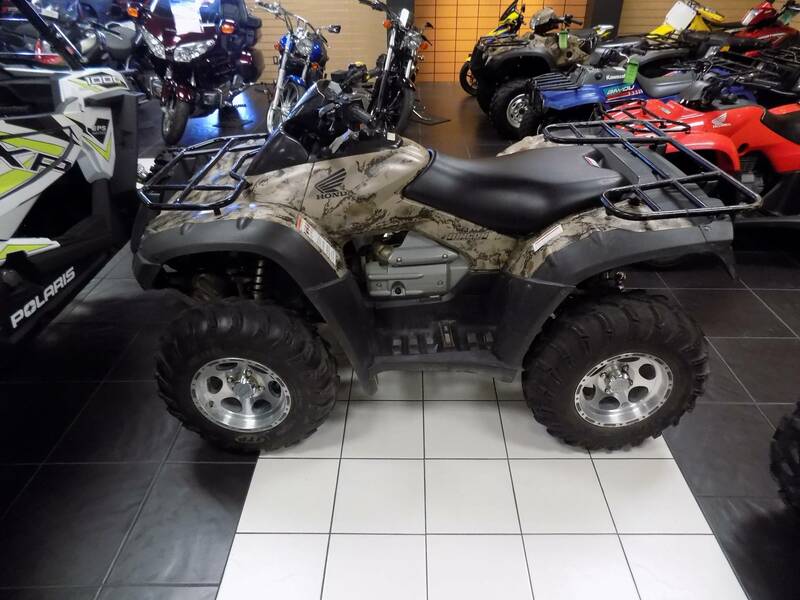 A rear center hydraulic disc brake and self-adjusting mechanical rear parking brake are mounted on the rear driveshaft, further reducing unsprung weight and contributing to the Rincon's considerable ground clearance. SUV-type radial tires provide a smooth ride and exceptional handling. 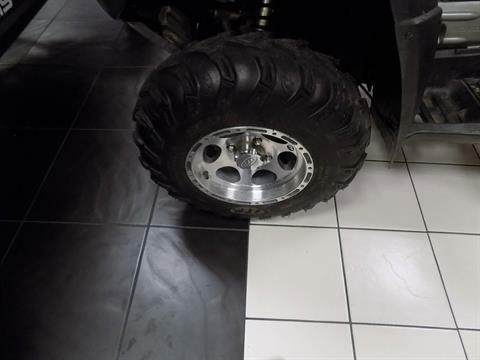 Tough, large-diameter 25 x 8-12 front tires and 25 x 10-12 rear tires provide added ground clearance. Attractive SUV-style large-diameter 12-inch aluminum wheels further reduce unsprung weight and contribute to superb handling. Engine is mounted longitudinally in the frame, allowing direct driveshaft alignment to front and rear wheels for improved drivetrain efficiency. Liquid cooling provides consistent engine operating temperature in extreme conditions for maximum power output and long engine life. Camshaft is located adjacent to the cylinder head, reducing engine height. Together with the semi-dry sump, engine height is farther reduced for a low center of gravity and excellent handling. Four-valve cylinder head with two short pushrods provides a broad powerband for optimum performance and engine efficiency. Snorkel-type air-intake system is specially designed for water crossings. Fuel injection features 40 mm throttle body, 12-hole two-pattern injector and Idle Air Control Valve (IACV ). Consistent engine performance at high altitudes. Remote-mounted fuel pump with internal fuel reservoir maintains consistent fuel-injection performance in rough and varying terrain. IACV valve maintains consistent idle in all conditions. Stainless steel exhaust system provides superior corrosion resistance and minimizes noise levels. Unique semi-dry-sump oiling system locates the oil tank inside the engine cases, lowering engine height and allowing optimum engine placement for excellent ground clearance and superb handling. Standard high-flow oil cooler ensures optimal engine lubrication under difficult operating conditions. The multiple-scavenging oil system utilizes an oil pump with three sintered steel rotors (one for feed, two for scavenge) to provide a stable oil supply in diverse riding conditions. Unique temperature indicator uses two sensors to monitor both oil and coolant temperatures. High-capacity coolant radiator is rated at 20.2 kW for efficient engine cooling in extreme operating conditions. Compact, flat-shaped radiator fan motor is lightweight and contributes to optimum engine placement. Rubber-cushion engine mounting system and gear-driven counterbalancer reduce engine vibration. Traxlok® is easily engaged with a simple thumb-switch on the right handlebar. An electromagnetic mechanical clutch unit (EMCU) located on the center of the propeller shaft engages 4WD with a quiet two-way roller clutch. Traxlok ensures smooth operation by employing a magnetic switching mechanism that engages when front and rear wheel speeds vary by less than 6 mph. Torque-sensitive front differential provides superior traction compared to conventional limited-slip designs, and reduces torque steer substantially for less steering effort in 4WD mode. The rear driveshaft joins the rear final-drive gearcase at a 77-degree angle, eliminating the weight and complexity of an additional shaft and joints. The design also contributes to the Rincon's considerable 8.0 inches of rear wheel travel. USDA-qualified spark arrester / muffler. The Honda automatic transmission shifts electronically- eliminating unsightly and trouble-prone vacuum lines- and features engine braking, unlike conventional belt-drive designs. Features a filtration system to protect against external contamination. The compact and maintenance-free design means there are no belts to wear out and replace. Using multi-filtered engine oil as hydraulic fluid, the design also simplifies maintenance and ensures an adequate oil supply in all operating conditions. Electric Shift Program (ESP®) allows the rider to manually select gears by simply pressing two push-buttons mounted on the left handlebar. A handlebar-mounted control switches the automatic transmission between ESP mode and automatic operation. A convenient column-style shift lever permits the rider to easily select drive, neutral or reverse. GPScape™ model features GPS unit with easy-to-read LCD display. 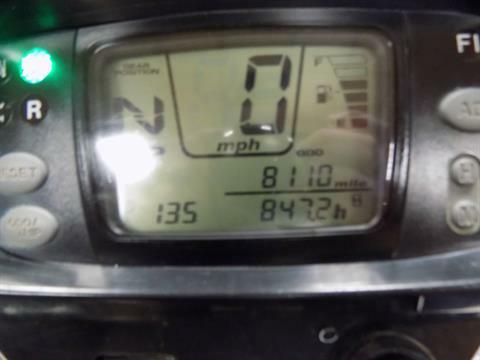 GPScape is contained within the standard meter assembly and features storage for up to 100 waypoints, digital compass function indicating travel direction and an automatic compensating clock. When traveling or returning to a designated waypoint, GPScape will tell the rider distance and direction from present location. Exclusive NaturalGear Camouflage color scheme offers a pattern that's soft, open and shadow-free for superior camouflage performance in a wide variety of conditions. Honda's largest liquid-cooled four-stroke ATV features a single-cylinder fuel-injected 675 cc OHV engine that provides ample torque and dependable power. 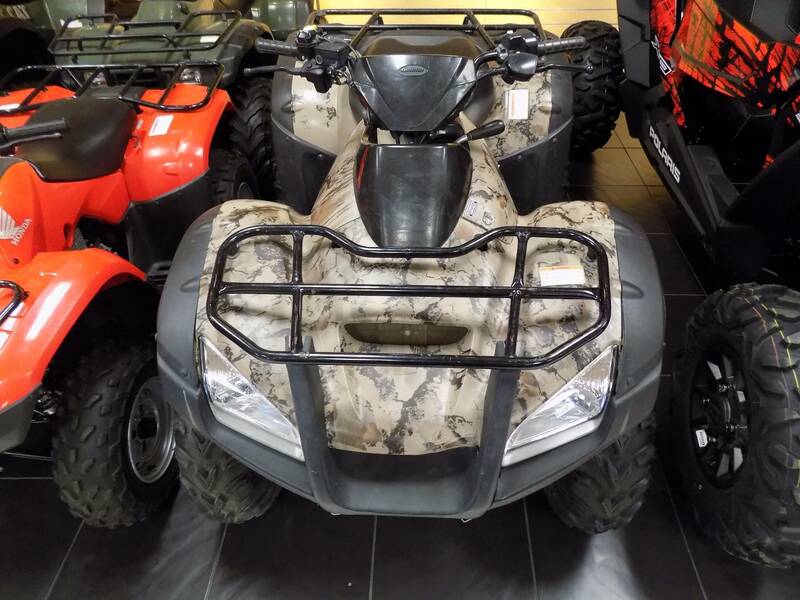 Honda's automotive-style automatic ATV transmission draws power through a hydraulic torque converter to drive three forward gears and reverse. The FourTrax® Rincon® features Honda's fully independent ATV rear suspension for comfortable cruising over the toughest terrain. Extensive weight-saving measures include the use of aluminum for the following components: forged front upper control arms, rear upper and lower control arms, rear knuckles, front and rear wheels. SUV styling features flowing fenders with integrated headlights and taillights.